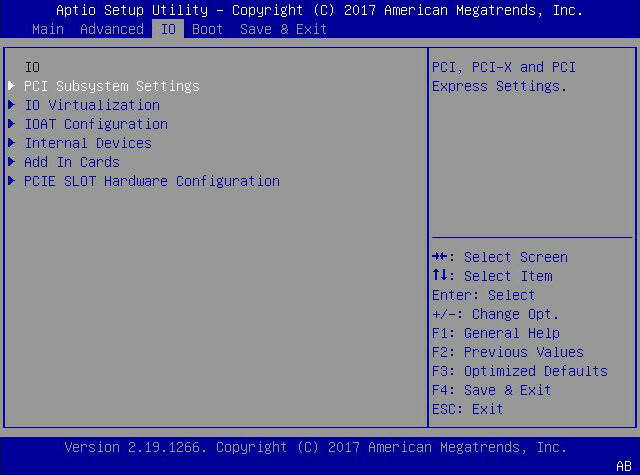 This section includes a screen of the BIOS IO Menu. The options that are available from the IO Menu are described in the table that follows. The following tables describe the BIOS IO menu options. Enable or disable Intel I/O Acceleration Technology (I/OAT) devices. The following table describes the BIOS IO Internal Devices Options. Displays and provides options to change the settings of the devices in PCIe slots.